Reacts with the alpha prime subunit. Immunogen was a synthetic peptide, which represented a portion of human Casein kinase 2, alpha 2 polypeptide encoded within exon 11 (LocusLink ID 1459). RIPA extract from HeLa cells. CKII is a serine/threonine protein kinase that phosphorylates acidic proteins such as casein. The kinase exists as a tetramer and is composed of an alpha, an alpha-prime, and two beta subunits. The alpha subunits contain the catalytic activity while the beta subunits undergo autophosphorylation. The gene for this protein is found on chromosome 20, but a related transcribed pseudogene is found on chromosome 11. Three transcript variants have been found, encoding two different isoforms. 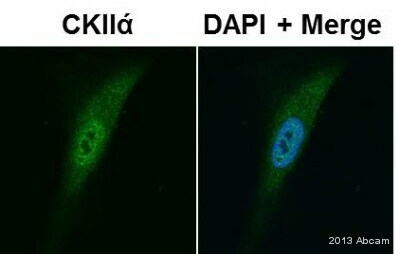 Protein kinase CKII is recognized as one of the key cellular signals for cell growth and proliferation; it also has an important role in apoptosis. Our Abpromise guarantee covers the use of ab10474 in the following tested applications. IP Use at 4-10 µg/mg of lysate. WB 1/1000 - 1/5000. Detects a band of approximately 39 kDa (predicted molecular weight: 41 kDa). Catalytic subunit of a constitutively active serine/threonine-protein kinase complex that phosphorylates a large number of substrates containing acidic residues C-terminal to the phosphorylated serine or threonine. Regulates numerous cellular processes, such as cell cycle progression, apoptosis and transcription, as well as viral infection. May act as a regulatory node which integrates and coordinates numerous signals leading to an appropriate cellular response. During mitosis, functions as a component of the p53/TP53-dependent spindle assembly checkpoint (SAC) that maintains cyclin-B-CDK1 activity and G2 arrest in response to spindle damage. Also required for p53/TP53-mediated apoptosis, phosphorylating 'Ser-392' of p53/TP53 following UV irradiation. Can also negatively regulate apoptosis. Phosphorylates the caspases CASP9 and CASP2 and the apoptotic regulator NOL3. Phosphorylation protects CASP9 from cleavage and activation by CASP8, and inhibits the dimerization of CASP2 and activation of CASP8. Regulates transcription by direct phosphorylation of RNA polymerases I, II, III and IV. Also phosphorylates and regulates numerous transcription factors including NF-kappa-B, STAT1, CREB1, IRF1, IRF2, ATF1, SRF, MAX, JUN, FOS, MYC and MYB. Phosphorylates Hsp90 and its co-chaperones FKBP4 and CDC37, which is essential for chaperone function. Regulates Wnt signaling by phosphorylating CTNNB1 and the transcription factor LEF1. Acts as an ectokinase that phosphorylates several extracellular proteins. During viral infection, phosphorylates various proteins involved in the viral life cycles of EBV, HSV, HBV, HCV, HIV, CMV and HPV. Belongs to the protein kinase superfamily. Ser/Thr protein kinase family. CK2 subfamily. 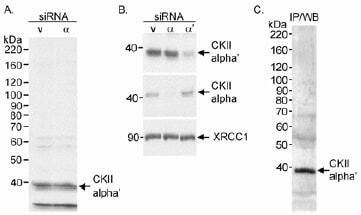 Detection of human CSNK2A1 by western blot of immunoprecipitates. Samples: Whole cell lysate (0.5 or 1.0 mg per IP reaction; 20% of IP loaded) from HeLa cells prepared using NETN lysis buffer. 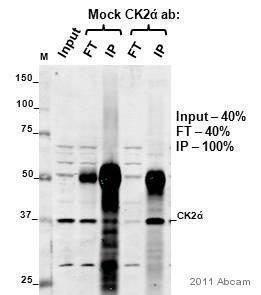 Antibodies: Affinity purified rabbit anti-CSNK2A1 antibody A300-199A (lot A300-199A-5) used for IP at 6 µg per reaction. CSNK2A1 was also immunoprecipitated by rabbit anti-CSNK2A1 antibody A300-198A. For blotting immunoprecipitated CSNK2A1, A300-199A was used at 1 µg/ml. Detection of human and mouse CSNK2A1 by western blot. Samples: Whole cell lysate (50 µg) from HeLa, HEK293T, Jurkat, mouse TCMK-1, and mouse NIH 3T3 cells prepared using NETN lysis buffer. 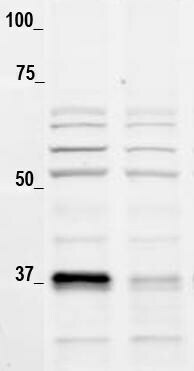 Antibody: Affinity purified rabbit anti-CSNK2A1 antibody A300-199A (lot A300-199A-5) used for WB at 0.1 µg/ml. Detection of human CSNK2A2 by Western blot and immunoprecipitation. A. RIPA extract (30 mg) from HeLa cells treated with CSNK2A2 siRNA or vimentin siRNA (v). B. RIPA extract (30 mg) from HeLa cells treated with CSNK2A2, CSNK2A2 prime, or vimentin (v) siRNA. C. RIPA extract (0.5mg) from HeLa cells. Antibody: ab10474 used at 0.33 (A) or 0.2 (B) mg/ml for WB or 5 mg/0.5 mg lysate (C) for IP. Detection of human CSNK2A2 by Western blot and immunoprecipitation. A. RIPA extract (30 mg) from HeLa cells treated with CSNK2A2 siRNA or vimentin siRNA (v). B. RIPA extract (30 mg) from HeLa cells treated with CSNK2A2, CSNK2A2, or vimentin (v) siRNA. C. RIPA extract (0.5mg) from HeLa cells. 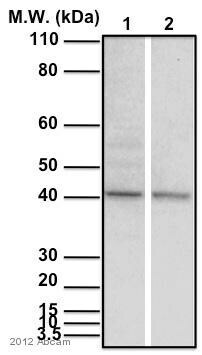 Antibody: ab10474 used at 0.33 (A) or 0.2 (B) mg/ml for WB or 5 ug/0.5 mg lysate (C) for IP. 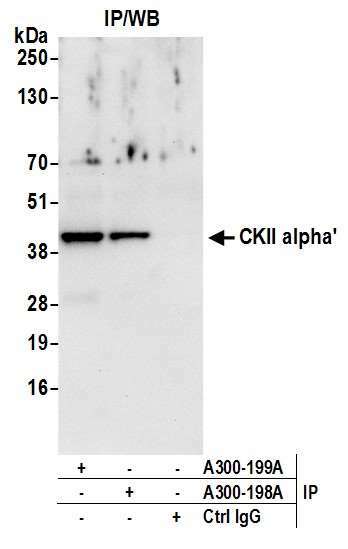 Western blot - Anti-CSNK2A2 antibody (ab10474)Image courtesy of an anonymous Abreview. Publishing research using ab10474? Please let us know so that we can cite the reference in this datasheet. Thank you very much for your rapid answer. Is it possible to get an small size sample to test the antibody first? 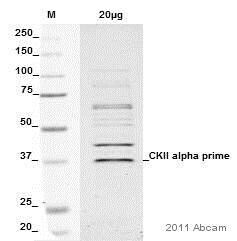 We only have the full size vials of all of our products, so unfortunatelywe don't have a small sample to send out.However, we will guarantee that this antibody is specific for CKII alpha prime and will work in the tested species and applications stated on the datasheet. Please let me know if you have any further questions or if there is anything else that I can help you with. Have a great evening! What is the homology between the immunogen and CKII alpha prime? Thank you for your call today and for your patience while I have been in touch with the lab about ab10474. The immunogen of ab10474 was taken from a region of divergence between CKII alpha and CKII alpha', so the antibody is not cross-reactive. 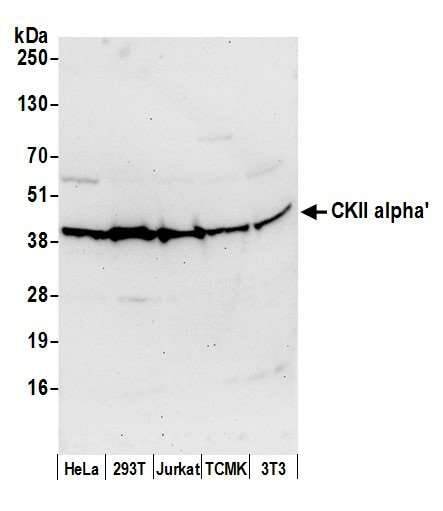 In the Western blot assays on the datasheet, no cross-reaction was seen between this antibody and CKII alpha. Thank you for your enquiry and patience. Under the conditions tested, which included WB detection at optimized dilutions using lysate from cells expressing endogenous amounts of the subunits, they were specific as specified. That is, ab10466, ab10468 and ab10470 react with the alpha subunit and ab10474 reacts with the alpha prime subunit. We would recommend loading 20-30 ug protein lysate. Please contact us again if you have any additional questions.